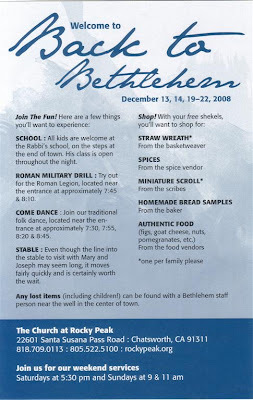 A little Christmas gem in the northwest corner of Los Angeles is the "Back to Bethlehem" event. It's held every year on the two weekends before Christmas in Chatsworth, in the San Fernando Valley, at the Church at Rocky Peak www.rockypeak.org. Click on this image for a larger (and more readable) view of the flyer. The church's web site describes it as "more than a nativity scene ... not a play". That is an understatement. It's a very impressive re-enactment of what life might have been like in Bethlehem as Mary and Joseph would have experienced it, entirely staffed by volunteers. And - admission is free. The wait to get in is very minimal. While Los Angeles doesn't get snow, it can get chilly, especially at night. If you plan on attending, be sure and bring warm clothes, hats and gloves. It's also an outdoor event - and certain evenings will be canceled if it's raining. Check their website. Hundreds of volunteers do an amazing job bringing this event to life. 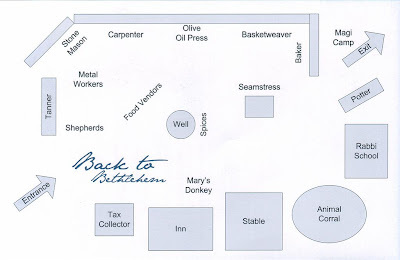 There was "no room at the inn" ... but a donkey outside of the simple stable nearby gave a hint of what might be inside. Waiting to visit Mary and Joseph, and their newborn son. This is a fantastic event for families to help explain the Christmas story to their children. Mary and Joseph inside the stable, sharing the story of the first Christmas with the thousands of visitors every night. Each year this event attracts 18,000 people over six separate nights. Outside the stable, sheep and goats. A reminder of the environment Jesus was born into. A volunteer lets kids touch a goat. At the edge of Bethlehem is the rabbi school. Children and adults gather around to hear the village rabbi share the prophecies about Messiah from Old Testament prophet Isaiah. Every visitor receives free shekels at the entrance. Spices were just one of the many items you could buy. Pomegranates. This vendor was smart and was prepared for a chilly evening. Warm bread: another popular item. The shops and stalls were in a circle around a large field that is part of the church's property. The entire event is outdoors. Our kids loved the freedom of being able to go from booth to booth, running around buying little things, having the small samples of food. It really helped bring the Bible to life: Jesus was born in a real place at a real time. While the lights of the San Fernando Valley are visible in the distance, the church is located in the foothills of the Santa Susana Mountains, adding to the authenticity of the event. A shepherd recounting his experience of the angelic visitation announcing Jesus' birth. What was impressive was that this particular volunteer playing the role of a shepherd was also bi-lingual. It was neat seeing the diversity of visitors that night, as well as many of the volunteers. A reminder that the gospel is for "all the people." At the edge of Bethlehem, a group of Magi were encamped, looking for "Him was was born King of the Jews." This map gives an idea of the many things to see and do. The night we went, the event seemed well attended, but never felt overly crowded. On behalf of our family and the thousands of kids and adults who experience this every year, a huge THANK YOU to the Church at Rocky Peak and the hundreds of volunteers that make this outreach to the community happen. Journey of Faith Church in Manhattan Beach www.journeyoffaith.com has a similar (although slightly smaller) event. While the concept of a "walk through Bethlehem" is not unique to Los Angeles, it is the largest American city where an event like this can be held - weather permitting - entirely outdoors. Hard to image this in a place like Chicago or New York. Come to think of it, our climate (Mediterranean) is also the most similar to what Jesus and those around him would have experienced.